Smart Writing Service is just another academic writing company, which does not differ from others but do have very competitive prices. They do have a variety of paper writing services, almost all needed by the average student. 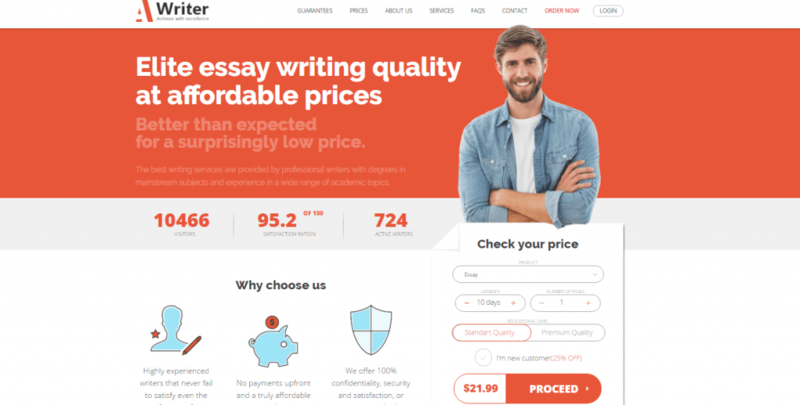 This company is considered to be a quality writing service, based on students’ reviews we were able to find. Smart Writing Service provides a different kind of academic writing service, they do have essays, dissertation writing, thesis writing, case study, lab report or any other paper you might need. The information about each paper order you can place at their website is easy to find and if you need a specific type of the paper you can use “Other” button at the bottom of the list of services and specify that kind of paper you are interested in. However, if you need for example to check already written work and get fast and effective proofreading or editing service you won’t be able to get it here. This service doesn’t offer such things. When you are paying for your papers you are investing into your future and you need to know if you won’t need to pay more for the work you are ordering. This is very important, in a case when you have a tight budget. And even finding trustworthy writing service, you are still interested in our paper to be delivered by top professionals. Smartwritingservice.com allows you to pay 25 % extra your work to be written by their top professionals. This seems to be too high, but when you have all guarantees it worth your money. Moreover, they do have low prices and price per page starts from 10 USD and can be up to 28 USD for an urgent paper with 24 hours turn-around. They are also offering different payment methods, like Pay Pal and credit card. They do provide loyalty program and discounts codes and your OFF depends on how much you have spent on orders with them. If you subscribe to their newsletter you will be able to receive all actions, discounts, and other things once they are available. The quality of a paper is probably one of the most important things you are considering while ordering online. And if the service delivers quality papers, you can say for sure that it is legitimate and able to cope with any task you have during the study. The process of order should be transparent and you need to keep in touch with the writer and the team to get updates. However, the quality is the thing it is not possible to monitor when your deadlines a burning, that is why you need to be sure that this particular service treats every paper as the most important one. So we decided to place an order to see how it works at Smart Writing Service. The undergraduate essay we have ordered met our standards of quality, but it was delivered a little bit late and needed several changes. During the order, we have chosen wrong citation method and at the middle of the process asked for change. We didn’t pay any additional fees and this is a big plus, moreover, the assistance we have got was polite and friendly. Yet, they could have done the paper better so to be sure you need to pay 25-30% extra for any paper with them. The support is available 24/7 via chat, US, and UK phone numbers. Agents are professional and ready to answer all your questions. They are also able to update you on writing process as well as pass your additions and questions to the writer right away. This company doesn’t much differ from other academic writing services, but the payment additionally for your work to be completed by professional is not good in case you are willing to pass numerous papers to the service.